Eagles left-armer A.J. Oliver pitched a three-hit shutout in his team’s 8-0 victory. WINSLOW — Lincoln Academy pitcher A.J. Oliver said he had no idea he had a no hitter going into the fifth inning of Friday’s game at Winslow. “I don’t look into that kind of thing. I just throw it. Whatever comes, comes,” Oliver, a lefty, said. 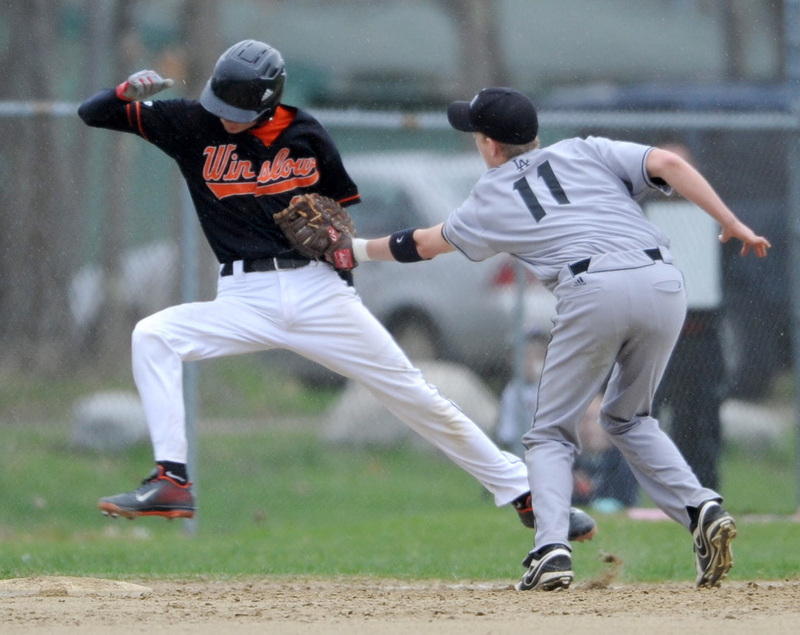 Staff photo by Michael G. Seamans Lincoln Academy first baseman Devin Scheter, 11, right, tags out Winslow High School's Tayler Roy, 11, in Winslow on Friday. Lincoln defeated Winslow 8-0. Staff photo by Michael G. Seamans Lincoln Academy's Devin Scheter, 11, scores as the ball goes by Winslow catcher Bobby Chenard, 4, in Winslow on Friday. Lincoln defeated Winslow 8-0. Oliver didn’t get the no-no, but was impressive nonetheless with a three-hit shutout in an 8-0 win. Lincoln improved to 4-3, while Winslow, which entered the game averaging just over eight runs per game, dropped to 5-2. Oliver worked around four Eagles errors in the first three innings. Winslow didn’t get a hit until Ben Smith’s infield single with one out in the bottom of the fifth inning. Dylan Hapworth and Trevor Lovely also had singles for the Black Raiders. Oliver walked just two, struck out four, and got 12 ground ball outs. “All I threw was a fastball today. I hit my spots, had my velocity today. It went well,” Oliver said. The Eagles provided all the offense Oliver needed in the first inning. Leadoff hitter Sawyer Pinkham reached on an error and scored on an Oliver single. Wally Morris then singled to drive in Oliver. “After my team and I got some runs, I got some confidence. We kept it up and we kept it going. This is the best my arm has felt,” Oliver said. Lincoln added two more runs in the second, on RBI singles by Devin Scherer and Oliver. The Eagles broke the game open with three runs in the top of the sixth, the big hit a Scherer single. Five Winslow errors led to five unearned runs, and Pinkham reached base four times, scoring three runs. “Anytime you let that leadoff guy on, that’s going to hurt any team. That’s what usually hurts us. 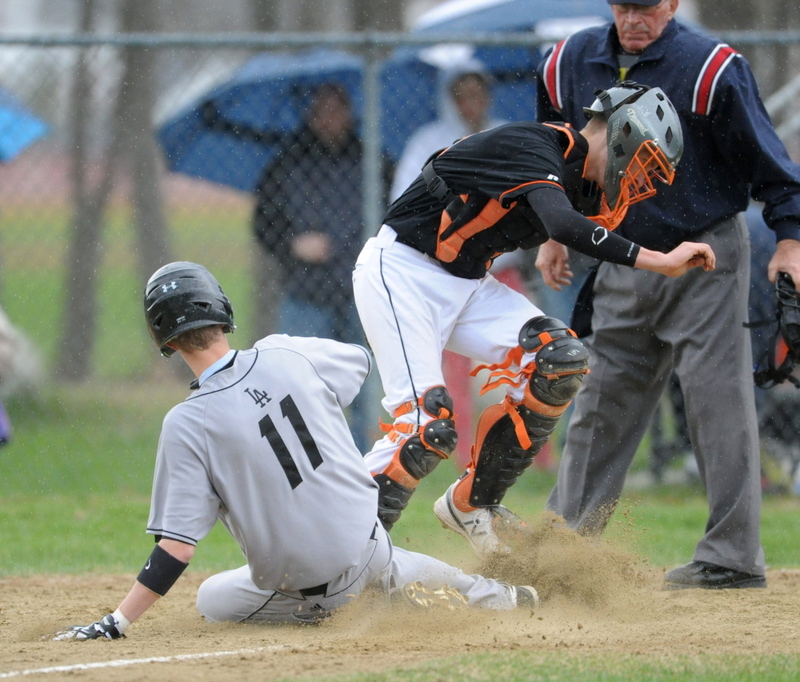 (Pinkham) hurt us right from the first inning to the last,” LaCasse said. Jake Trask took the loss for Winslow, pitching 5 1/3 innings with four strikeouts and three walks.